Pegasus micrometeoroid satellites were carried on the last three Saturn I flights, affixed to the S-IV stage and carried inside the service module boilerplate. Its mission was to determine the micrometeoroid environment in near-earth space; this information would be used to determine if shielding on the under-development Apollo spacecraft was sufficient. The Pegasus satellite consisted of two "wings" emanating from a central frame. The wings were about 14 feet tall and spanned 96 feet. 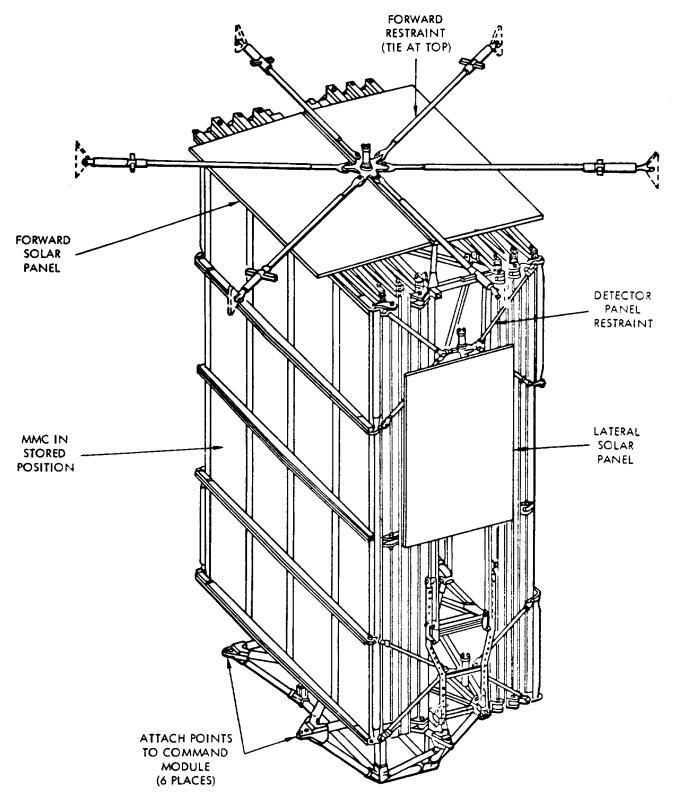 An artist's conception of the deployed Pegasus configuration can be seen in NASA photo MSFC-75-SA-4105-2C (aka "MSFC-9801797" or "NASA-M-67 R&DO-8448"). 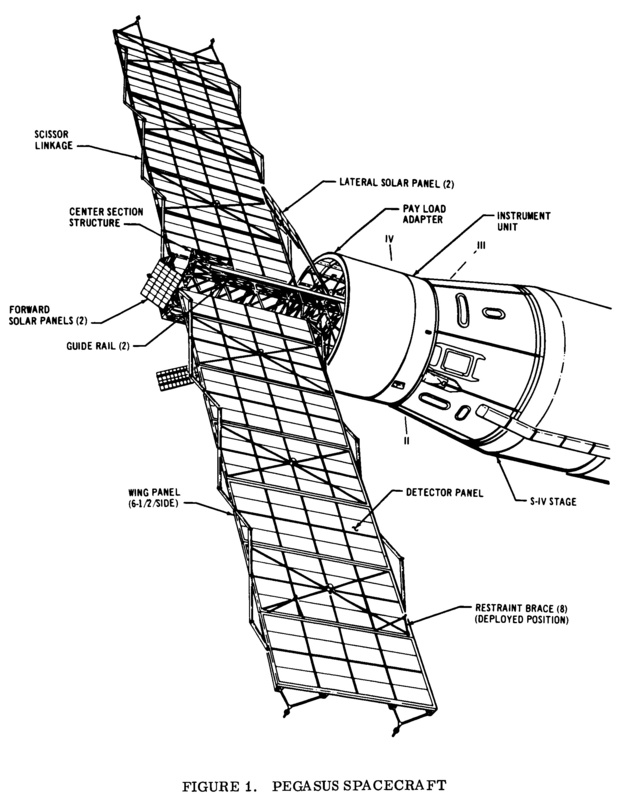 The Pegasus Spacecraft is designed to fit within the space available in the boilerplate model Apollo Service Module and Service Module Adapter. During launch, the wings are clamped in a folded position against the spacecraft center structure. The Service Module, the Service Module Adapter, and the Command Module form the shroud over the spacecraft during launch. After injection, explosive nuts, which secure a tie at the top of the Service Module to the top of the spacecraft and secure the Service Module to the Service Module Adapter, are activated and the Service Module and Command Module are ejected forward by a spring-powered separation system. The Pegasus remains attached to the Service Module Adapter, Instrument Unit, and depleted S-IV stage. Sixty seconds after initiation of ejection of the shroud, explosive nuts securing the wing cinching arms are activated. The wings are forced outward by means of springs placed in the hinges between wing sections. An electric motor-gearbox system connected to the wings by means of a torque tube and scissor linkage serves to control the rate of deployment of the wings and as a backup deployment system to assure positive locking of the wings in the extended configuration. In the deployed configuration, the wings span a distance of approximately 29.3m from tip to tip. The wing width is 4.1m. The total meteoroid detector area, both sides of the wings combined, is about 200m2. Of this area, 8m2 are composed of the 0.04-mm-thick detectors; 17m2 of 0.2-mm-thick detectors; and 175m2 of the 0.4-mm-thick detectors. The center structure of the spacecraft is an open framework of square drawn aluminum tubing. In addition to providing the supporting structure for the wing frame members, it also supports the deployable solar cell array. It is attached to the Service Module Adapter at the separation plane between the Adapter and the Service Module by a six-point mounting pad support system. The upper section of the spacecraft, carrying the wings and solar cell arrays, is cantilevered above the mounting plane. The center structure extends about 0.5m below the mounting plane; the major electronic systems are housed in a thermally controlled canister located in this area. The NTRS has a nice, general-public NASA Facts publication on the Pegasus satellites. I've seen two Pegasus mockups, one at the Michigan Space & Science Center and one in a USSRC warehouse. Click image for a 1792x2124 pixel version of this image in a new window. Taken from p. 140 (p. 150 in the PDF) of the Pegasus Program Final Report . Click image for a 1964x2520 pixel version of this image in a new window. Taken from p. 5 (p. 14 in the PDF) of the Pegasus First Summary Report . Taken from Saturn I/IB Quarterly Report No. 23 (Jan., Feb., Mar. 1965) . Video capture and animation by heroicrelics.org.